skywalker trampoline weight limit we get it. It very hard to understand the weight limits of trampolines. Especially, when you’re factoring in different options, trying to add the children’s weight over growth time, and accounting your fast foods and extra desserts and not to forget, what if your big uncle Joe wanted to spin on your new trampoline? What then? Not to worry. We got you covered here. 0.1 What can you get from this post? 0.3 What is a weight limit? 0.4 How will the weight limit be calculated? What can you get from this post? You will understand the weight limits for different skywalker trampolines, and how it is calculated. Well, first things first. What is a weight limit? Weight limit is the maximum amount of weight a trampoline can bear in a normal use. In simple words, if you have a trampoline with a maximum weight limit of 250 lbs, you don’t let your pet hippo weighs 3000 lbs to test it out. Trust us. How will the weight limit be calculated? Skywalker trampoline weight limit is calculated based on ASTM (American Society for Testing and Materials) standards. During the ASTM testing, the trampoline needs to withstand 4 times more weight than it is specified for the user. In other words, if the trampoline weight limit is 250 lbs, then that trampoline needs to pass the test weight of 1000 lbs. The name of this testing process is called as a static load test. This test is applied to the frame, trampoline bed, and the base shape. This is how it works. There is something called as the loading disk on the trampoline. 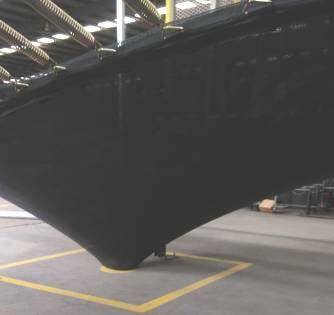 This disk will be lowered onto the surface. After that, leave the disk in its place for five minutes to check if there is any deformation or breakages in the trampoline frame, bed or the trampoline springs. If there is no deformation or breakages then the trampoline is passed the test. Check out the video below. This is a skywalker 12 trampoline weight limit test. To know more about the “static load test” in an entertaining way, check out the Slow Mo Guys on one of the Skywalker trampolines. This is a 15 ft trampoline weight limit test. NOTE: Don’t try any of these in your home. These tests have been done in a controlled environment. One thing to keep in mind. 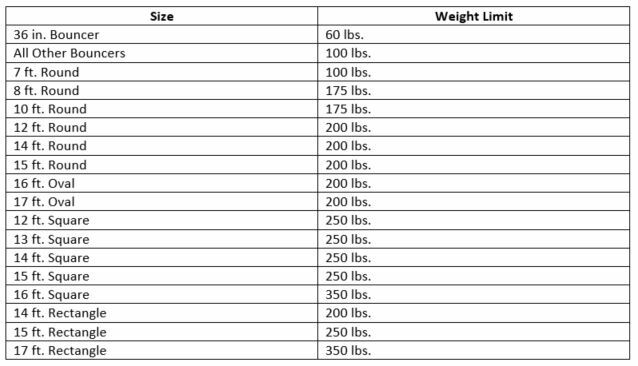 Not all the trampoline brands and company will go through this ASTM weight limit test. And probably most of the trampolines may not withstand the 4 times of recommended weight. You should feel comfortable and secure when you jump on this Skywalker trampoline. Because all the Skywalker trampolines go through the ASTM weight test to make sure that it withstands heavy loads. Hopefully, when it concerns skywalker trampoline weight limit, we’ve got you covered here. All the skywalker trampoline are heavy duty trampoline. Hence, you can be happy without having any concerns of safety. 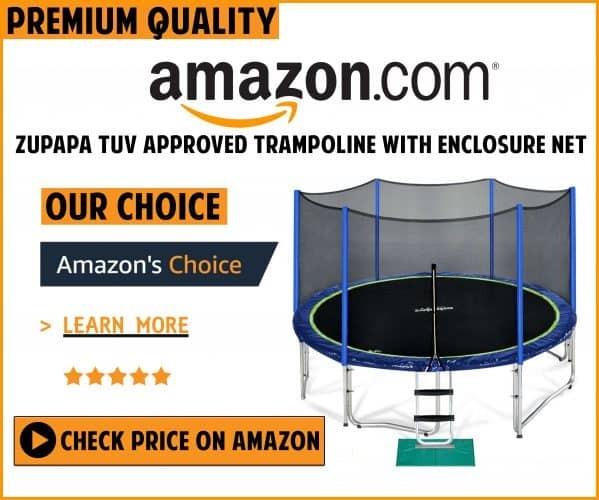 Skywalker Rectangle Trampoline Review – Should You Buy This? 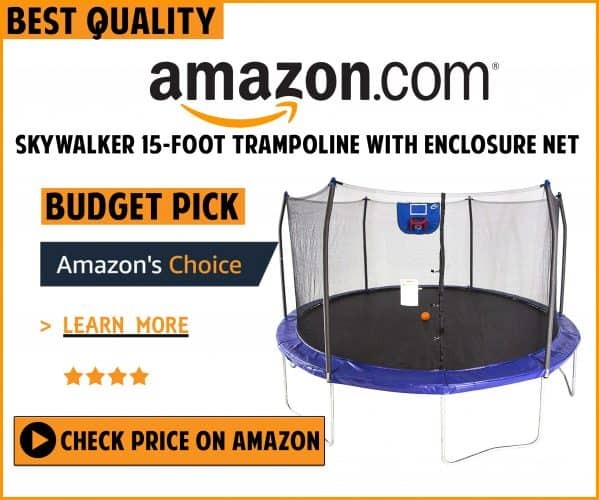 Skywalker 15′ Trampoline Reviews – Is This 15 Feet Trampoline Worth It?